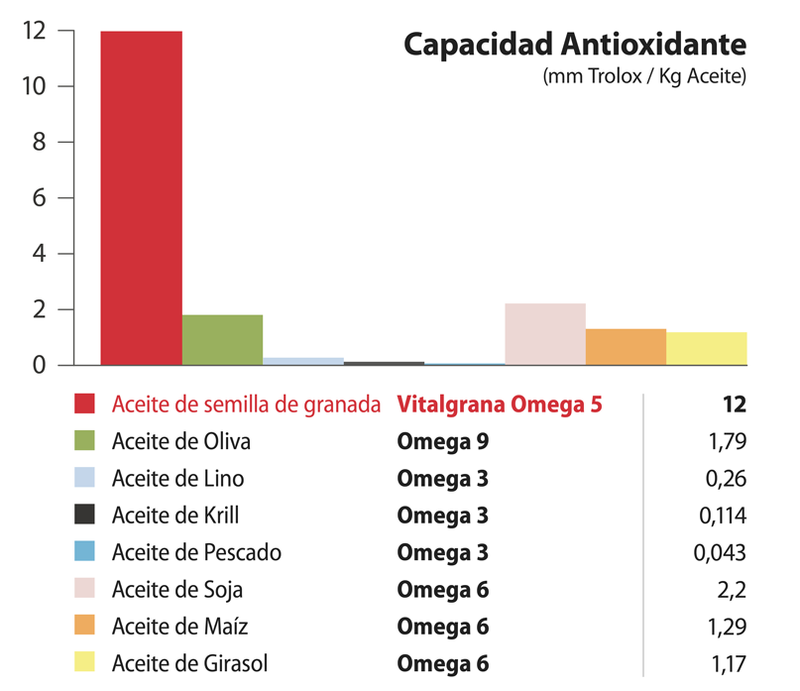 ﻿ What is Omega 5? Omega 5 is an unsaturated fatty acid with positive properties for our health, which is obtained mainly from the seed of the pomegranate. It is known as Punic acid and is the known botanical form of conjugated linoleic acid, a compound that has characteristics similar to CLA, conjugated fatty acid derived from Omega 6. 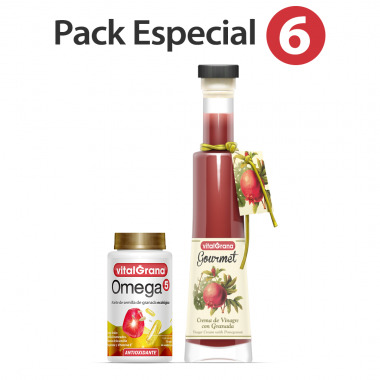 Pomegranate has five times more Omega 5 than green tea and more than double that of grape seed extract. The properties of both acids help in the loss of body fat. 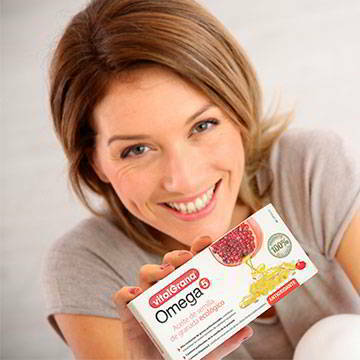 However, Omega 5 acid is much superior since its molecules have three double bonds instead of two. 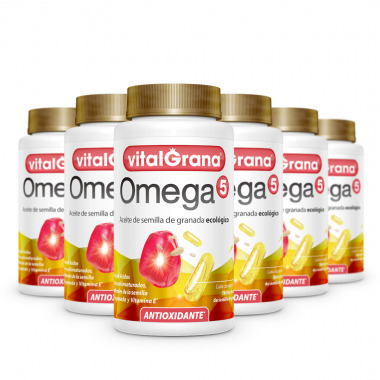 The oil in the capsules of Vitalgrana Omega 5 is extracted from the cold pressing of organic pomegranate seeds. 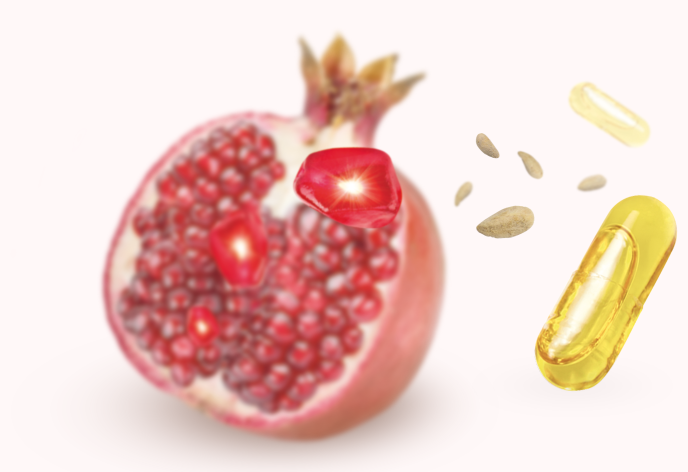 According to several studies, Vitalgrana Omega 5 pomegranate seed oil has a higher antioxidant activity than other oils of vegetable origin, as well as a higher concentration of antioxidant polyphenols. Therefore, they help your body to produce more collagen, elastin and telomerase to keep your skin and your body young and healthy. The food supplement should not be used as a substitute for a balanced diet. It is recommended not to exceed the recommended daily dose. Keep out of reach of children. Conservation: Cool and dry place. Protect from direct sunlight. Net Weight: 50 g / 60 capsules (0.84 g per capsule). 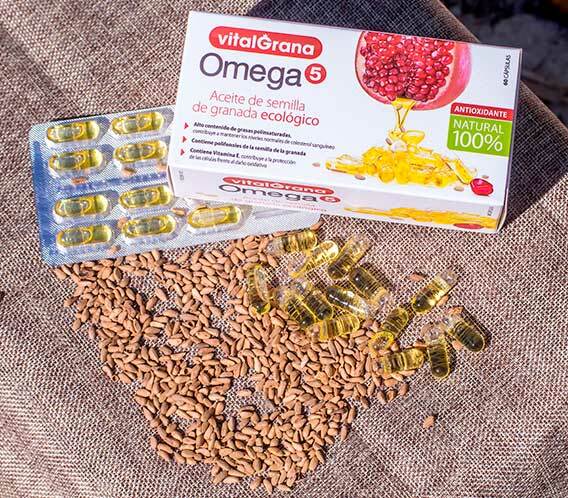 You need 5 kilos of pomegranate to get the 45 grams contained in each of the Vitalgrana Omega 5 pomegranate seed oil capsules. For its extraction, chemical products and heat are not used, rather it is a cold pressing. Thus, we get a product of the highest quality and potency that maintains all its nutritional value. In this way, you can get all the benefits of its use. It contains a large amount of polyunsaturated fats, so it helps maintain healthy cholesterol levels. In addition, it improves glucose tolerance and the lipid profile of people with hypercholesterolemia. 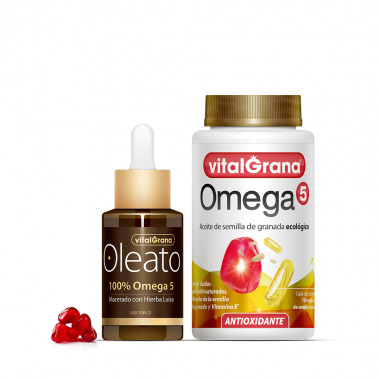 The Omega 5 of the oil that is extracted from the seed is a perfect anti-ageing treatment. It stimulates the production of keratinocytes, helping the skin to regenerate by increasing the epidermis. Prevents premature aging by braking free radicals produced by the environment or by the body itself.